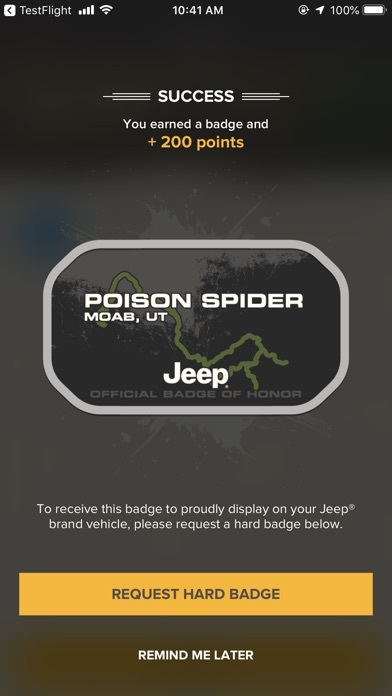 As the official companion app to the online community of the same name, Jeep® Badge of Honor puts the off-road experience in your hand — so you can join in ‘celebrating off-road enthusiasts who've chosen the road less travelled’ — anywhere and everywhere you go. 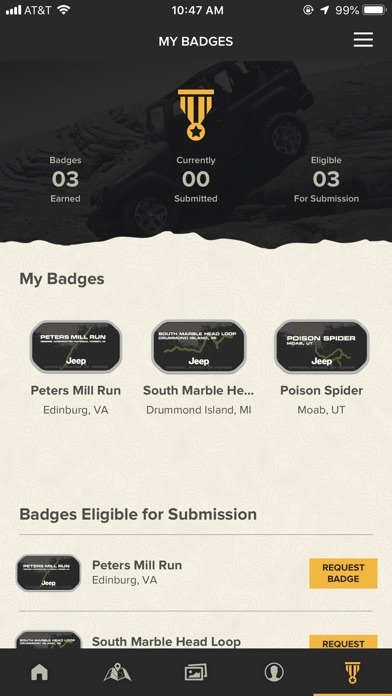 Off-roading fans can now sign in, sign up and check in to legendary off-road trails across the U.S.A. earmarked by Jeep® Badge of Honor, plus: ▪Discover specially featured off-road trails and maps, ▪Get trail locations and directions, information, trail highlights and trail difficulty ratings ▪Earn Trail Points and ranks within the Jeep Badge of Honor community, plus special Hard Badges to put on your Jeep vehicle ▪Upload and share photos from your adventures with other fans in the Jeep Badge of Honor community ▪Enter Off-Roading 101 for off-roading basics, important safety reminders, the history of off-roading, information on dealing with different types of off-road terrain and to learn about Jeep Trail Ratings Download it today to take the Jeep® off-road experience with you everywhere you go. Then get out and hit the trails! 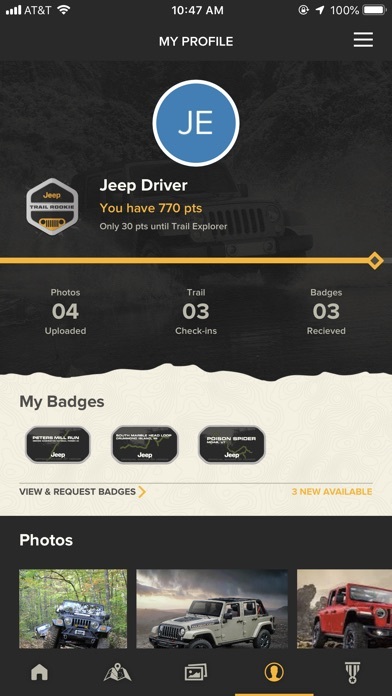 Plus, don't forget to visit the online Jeep® Badge of Honor experience at jeep.com/en/badge-of-honor to connect with the Jeep Badge of Honor community, check out other off-roaders’ photos, enjoy and upload videos, track your progress and check out what’s new in the off-road community before planning your next adventure! I did my first trail and got the badge in less than a week! This is great marketing when done well. Very cool badges. Well we just got back from Moab and ran a few trails. One of which was Top Of the world, but service wasn’t good enough to check in. So that means they didn’t count my trail run. After 4 emails sent I have yet to get any response. So 1 star until it get fixed and I get my badge. This is a great example of a great idea and program run by complete idiots. You will NOT get your badge in 8-12 weeks. You will NOT get your emails answered. You will NEVER get to speak to a live person about all the delays of the first two mentioned problems. 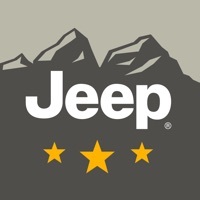 I just called Jeep HQ to let them know about the program and it’s LACK of customer service and LACK of following through with what they offer.....and they knew the program sucked. In their words “it is outdated” although they keep the website up and still have people downloading this app which promises 8-12 wait time on badges. DONT FALL FOR IT.....you want get badges and won’t get answers when they don’t come. I completed three trails in October and still haven’t received any badges. They have emailed me multiple times assuring me that the badges were going out by the end of 2018. Then they emailed me in January saying they were going out by the end of January. It’s now February and no badges. It’s a joke. I’m completely surprised jeep continues to associate with them! I love that this has easy-to-navigate maps and accurate trail descriptions. The badges are neat too. I love seeing other photos and interesting points. Three improvements that should be made: 1. Downloadable maps that work with UConnect/Apple CarPlay. I’d love to have Jeep GPS in the car through this app. 2. Get badges out quicker. Takes over two months right now. These should be easy and it helps breed enthusiasm. 3. More trails. You don’t even have to make a badge, just get some more trails on here. Still waiting......... why have and develop a app if you are not going to have any sort of customer service? Also 1 trail in Arizona? Really? Sedona is a Jeep Town full of well known trails. Keep up the crappy work. 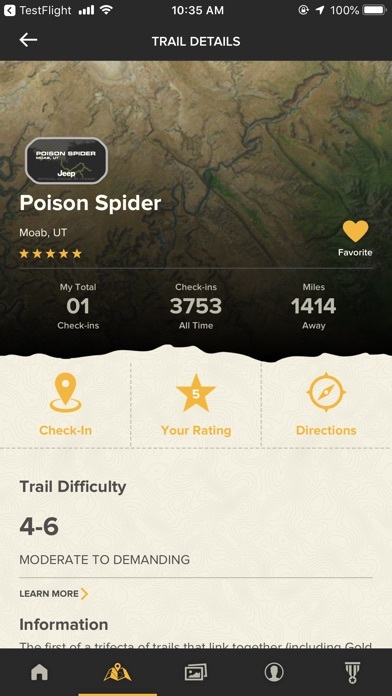 The app lets you continue without logging in and check into a trail. Once finished you dont get a badge because you didnt log in. Either let me register and login with my own email address or dont let people check into trails without logging in. Going on 2 months now trying to get my badge. Have only received 1 email so far from Jeep to help fix this. How is the signal strength at the trailheads? I have Verizon. I’ll put in a good review after my trip to Colorado and Moab next month if this app works the way they say. This I a cool looking app, as long as you don’t live in the southeast!! There are great trails in lower Alabama and all over Florida, but the closest trail on the app is in Huntsville or hot springs Arkansas! They need more trails in the southeast!! It seems that Jeep doesn’t care about this app. When you try to go to app support it just brings you to the jeep website. No links to any special email addresses or developers or anything. 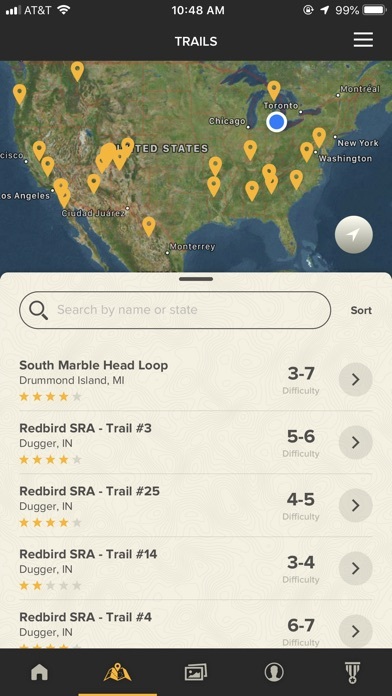 Out of the hundreds of great trails across the United States, this app only recognizes like 30 trails. There’s two official trails in my state of North Carolina that i know of - the Pisgah Forest Brown Mountain OHV and Uwharrie Forest....There’s no way to send these locations to jeep within the app to have them added to the Jeep Trails lists. Poor. Pretty app, but poorly managed. After this update I initially lost all my data. I emailed Jeep badge of honor and got it all back! Thank you app developers. Also, got all but one badge in three months. Whoever maintains this app is extremely incompetent and lazy. They could care less about the users. You’ll be lucky to get any badges and if you do I doubt they’ll be the right ones. This app blows!!!!! Don’t waste your time. So with this new update I lost all my badges and post and points!!! So upset Badge of Honor are you going to be able to fix this? I downloaded this app months ago despite the negative reviews. I open the app on a daily basis to get my login points toward the first badge. I was about 70 days away from reaching the first one. After the last update with the Facebook login issue I have now been reset to 110 points. This is garbage. Their app support is the Jeep website. Facebook authentication is broken again. I don’t know why this is so difficult to keep working. Facebook error message says the BoH app is in development mode and I need to be a registered test user to use it. Maybe the program is being shut down? I'd love to get some badge of honor hard badges, but I will NEVER associate any third party app to a social networking system. They need their own login system. I should have looked at the reviews first. Disappointed all around. Deleted within 10 minutes. Google log in was not fixed the update today. I just got this app so I haven't had a chance to use it yet, but I'm already disappointed. There are only six trails listed in all CA, but I know there are a lot more trails than that within a three hour drive of me. I would like to be able to get badges for those trails and find out about more with the app. I wish I could give this app 0 stars. I drove a trail 8 months ago and checked in with this app. After a few months of not getting my badge, I started to e-mail the badge of honor people. I was told that they would send it to me but they never did. Now 8 months later, I have e-mailed them probably 10 times and each time they say they will send the badge but they never do. Good luck getting your badges!!! Waste of time. I have only received one badge out of 14 check ins. And there were a total of 3 trails checked into when I got the one. This is over the last 12 months. I received an email asking me to update my address. The same address they sent the one badge to. Well the web site won't let me log in. No one will answer my email replies. So I guess I've wasted my time. Do yourself a favor and don't bother with badge of honor app. It's a waste of space and energy. If I ever get an answer to an email or my badges I'll update this review. But after a year of this I doubt it will ever happen. Poorly designed app. If you do not have cell phone service at the trail, then there's no way to get credit for running the trail. We did Superlift ORV Park in May and still have not received anything from Jeep. We did a dozen trails in Ouray two weeks ago - none had cell service and there's no way to get credit for the trails if you are more than 10 miles from the trailhead. This app is pointless - deleting it. The poor layout and lack of any real usefulness are bad enough, but to offer these "badges" and then never actually send you anything truly makes this app deserving of zero stars. Great idea. Poor execution. Seems to fall short in several areas. There sure could be more trails included. I checked in for Ophir Pass, but was offline due to no cell service. The app said I would receive credit the next time I was online. I rode the entire trail, but never received credit, or the badge. Just another time sucker. App does what it's intended to do. Helps me add legitimacy to trails and gives the family a reason to road trip. By Fix you broken app! Here's an idea, use some of the 45k I spent on buying a Jeep to fix the problem with the app!!!!! Love the App but the map in closing every time I click on it. As with all of the other reviews, the app crashes when you touch the map icon. I deleted the app after a day. Argh, the feature that drives the entire concept of the app causes the app to close. Map app still crashes entire app. I think this would be a great app if they could get the mapping worked out. 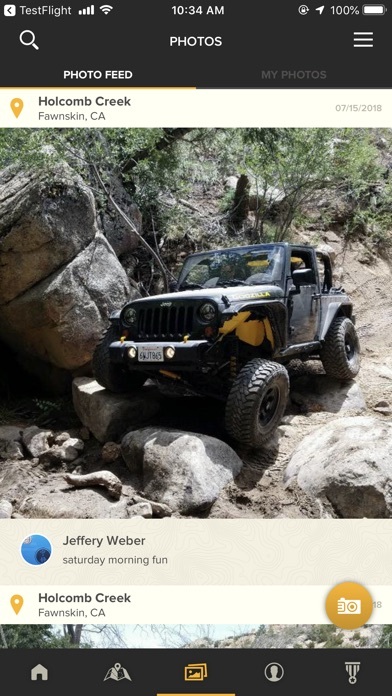 Locating Jeep trails was the main reason for downloading it. The app crashes every time I click on the map icon. It says the closest one is 130 miles away and I know that is not the case. Needs fixed. The app now crashes when using map/trail locator icon. App crashes when clicking on map icon. And where can you locate other trails? I've used this app for about a year now and I've loved it. I've gotten several badges with it but most recently I got logged off on a trail when trying to check in, and now cannot login with Twitter. Very disappointing and would love to continue using this app but cannot. Would love to use the app however there are just a handful of trails. Unless you are near Moab or the rubicon there probably isn't one near you. Needs lots more trails or more spread out over the states. this app seems to be a good idea, but there are NO trails anywhere in texas! I live in houston, the third largest metro in the U.S. And there isn't a single trail in the state!?!? App seems to be a HUGE miss IMO. I have been using this app over a year. It is designed to make you excited about using your Jeep on new trails and all it does is generate disappointment. This weekend I checked into multiple trails around Ouray and got a check-in confirmation in the app. Today there is no record of it. Even on the 10+ previous trails I have checked in to, they sent me the wrong physical badge 3 out of 10 times. The entire group at Chrysler running this program just can't seem to get it together. Yes it's free, but it would be better off if they did nothing vs doing it as poorly as this app does. 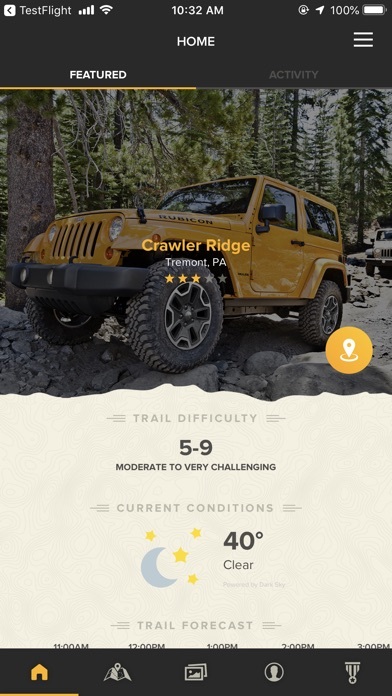 Love the idea behind this app, but Jeep really needs to add new trails every year. With so many trails across the U.S., there's no excuse for the selections being so limited.